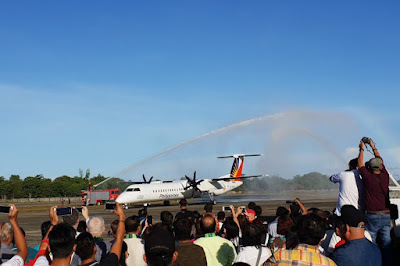 Aviation Updates Philippines - Philippine Airlines' regional subsidiary, PAL Express launched on Sunday, December 16, the twice-weekly turboprop flight between Clark, Pampanga and San Jose, Antique. ANTIQUE SERVICE. PAL Express commenced Clark-Antique flights on Sunday flying twice per week. Photo from CAAP Media Communications Office. Flights are flown using PAL Express' newest fleet of Bombardier Dash 8 Q400 NextGen aircraft capable of seating up to 86 seats in a dual-class configuration. The inbound flight, 2P2205, departs Clark on Sundays and Tuesdays at 6 a.m. and arrives in the province of Antique at 7:20 a.m. The return flight, 2P2206, departs at 7:40 a.m. and arrives back in Clark at 9 a.m.
“With PAL flights coming to Antique, more Antiqueños would be able to fly home more often and experience the efficiency of air travel. We witness another milestone for Philippine aviation," Civil Aviation Authority of the Philippines (CAAP) General Director Capt. Jim Sydiongco told GMA News Online. In anticipation of the new flights, CAAP extended Evelio Javier airport's runway to 1.4 kilometers. It also repainted the runway and taxiway markings and provided a canopy for arriving guests. Those are just few of the improvements and upgrades CAAP made to consider the airport as passenger-ready.